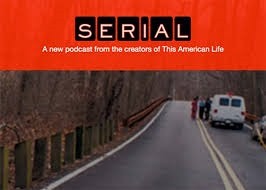 I couldn’t possibly have been more primed to become a Serial podcast fan. Hailing from a family of lawyers, in my early twenties I was obsessed with true crime writing – my favorite book was Fatal Vision, not least for the very messy relationship between author Joe McGinnis and convicted murderer Dr. Jeffrey MacDonald. With the launch of Court TV in the early 90s I turned to TV for my true crime fix, enjoying even the most mundane of trials for their revelations about real lives. Having been raised in Cleveland, Ohio, in a truly barren television era, the only factual offerings being the news, 60 Minutes and Candid Camera, I was desperate for real life stories. No wonder then, since moving to London in 1996 I have become obsessed with documentaries and all of the messy truths they unearth, and made them the focus of my working life. A latecomer to This American Life, I’ve spent the last 18 months listening to all of its 500+ archive, while walking the parks of North London. When This American Life announced recently they were launching a second podcast, Serial, its episodic unfolding of a long-ago Baltimore murder seemed tailor made for me. What I didn’t expect was that five million people would feel the same way. Having devoured its first episode within hours of launching, I didn’t have long to be a smug early adopter before it became the most successful podcast in history. This week, before the end of its first season, it has won an DocLab award at IDFA, for Digital Storytelling. As a Serial fan, I find myself a mid-level obsessive – not at the level of pouring through the sprawling Reddit site, where amateur sleuths strut their stuff. But I have begun listening to Slate’s Serial Spoiler podcast, and read a score of articles dissecting its success. For me, and many of its fans, what’s mesmerizing about the storytelling is the way that producer Sarah Koenig takes listeners through a journey that is meant to mimic her own, and all the twists and turns she has undergone trying to figure out whether Adnan Syed murdered his ex-girlfriend in 1999. More than anything, this masterful manipulation of the journey of discovery reminds me of the equally brilliant The Imposter documentary. In telling how a 20-something Frenchman impersonated a missing Texan teenager – and was accepted into the family home – the talented British production crew steers the audience through the same journey they undertook, when exploring the long ago story. The Imposter is worth buying the DVD, as it contains a thoroughly engrossing making of extra. Both stories investigate old crimes in astonishingly innovative storytelling. As Serial approaches its first season finale, I’m looking forward to its phenomenal success kicking off a new wave of true crime investigative journalism.